I’ve been a computer guy for a long time now, but I’ve been enjoying Christmas even longer. I got my first computer, a TI-99/4A, on Christmas morning, 1982. I was 10 years old, and from that Christmas on, it was games and hardware I wanted Santa to leave me under the tree. On through my teenage years, part of my ritual for getting into the Christmas spirit and enjoying the holidays was downloading and watching Christmas demos on whatever system I had at the time (and every platform out there had a few of them). Enjoying these demos is a personal tradition that I had, sadly, long left behind until last Christmas when I was inspired to seek out one of the demos I remember best, Audio Light’s 1985 musical slideshow for the Atari ST. With the help of an emulator, I captured it to share online with readers. Here, a year later, I recently brought it up and watched it run through it’s pixellated images and 3-voice musical holiday greeting. As I watched, it occurred to me that it might be nice to gather a few of the other demos I remember from those good ole’ days and present them here, in order to perhaps share some of the holiday cheer that they used to inspire within me. The following list of demos ranges across a number of platforms of olde. I’ll start with the Atari ST demo I presented last year. Happy holidays, and I hope you enjoy the shows! UPDATE (12/2011): It’s not a Christmas thing I’ve ever seen in person, but after just being reminded of it online, I had to add Sega’s two-level Saturn freebie Christmas NiGHTS to the list. What a lovely game it is. UPDATE (12/2012): Here are a few more demos I’ve found and added in before I re-tweet this now-year-old post for the 2012 holidays. UPDATE (12/2013): And, a few more Christmas demos for the third Christmas this post has seen. Have a look, and have a happy holiday! UPDATE (12/2014): Yet more Christmas demos from out on the Internets for the fourth Christmas in a row this post has been updated. Enjoy, and have a happy holiday! 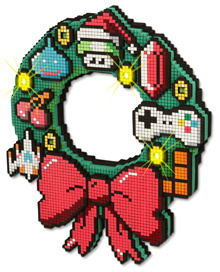 May this holiday season bring you all faster modems and floppy disks galore! This entry was posted in Multi-Platform and tagged christmas, demoscene, festivus, retro, scenedemo, seasonal, vintage. Bookmark the permalink. Ah, that was indeed fantastic and made me remember that pretty careless period I truly cared about Christmas and the overall festivities. Ah, the warm feeling of childhood nostalgia. And for some reason Willy Beamish.